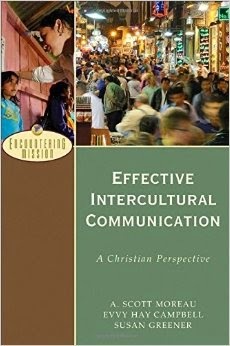 The latest book in Baker’s Encountering Missions series, Effective Intercultural Communication: A Christian Perspective by A. Scott Moreau, Evvy Hay Campbell and Susan Greener, became available at the end of 2014. The authors state their “task is to walk you through the critical elements that comprise an introduction to intercultural communications for Christian workers of all types” (p3). The book is divided into four major parts. Part one is an introduction to intercultural communications providing “an overview of the historical development (both secular and Christian) of intercultural communication and deal with implications that are important for people who cross cultures to communicate Christ.” (p3) Chapter 1 defines terminology of culture and communication theory briefly. Chapter 2 touches on secular and Christian development of the discipline. Chapter 3 notes theoretical and methodological approaches to intercultural communications along with a discussion of the purpose of communication from a Christian perspective. Part two turns “attention to the foundations underlying patterns of intercultural communication.” (p4) These foundations include: Worldview (ch4), verbal (Ch5), Societies and Social Institutions (ch6), and Networks, In-groups, and Social Change (ch7). The authors develop worldview as a basic set of functions that serve as a “map of life” and a “map for life” (p.57, 58). “These assumptions, and how they are worked out, are seen in three primary dimensions: cognitive, the content of the assumptions; affective, our feelings related to the assumptions; and evaluative, the moral structure that we build from our assumptions.” (p.56, 57) The impact of these dimensions are reflected on in part three of the book. The “four major types of societies found in the world today: (1) band, (2) tribal, (3) peasant, and (4) urban” (p. 83) are explored in chapter 6. Closely related, chapter 7 discusses status/role, groups, and social change. Understanding these issues together with worldview and language form the foundation for patterns of intercultural communications explained in Part 3 of the book (ch. 8-14). Seven categories of nonverbal communication are explored in chapter 8. The authors give a basic description of each category and then asks 3 or 4 questions to help the reader think about nonverbal communication in a new cultural context. Nonverbal signals vary greatly across cultures. The text helps one think through the minefield of potential errors. Chapter 9 contrasts low-context and high-context cultures. People from low-context cultures need to pay more attention than they are accustomed, to the nonverbal cues to determine meaning. The authors point out that contexting is embedded in the three dimensions of worldview discussed in chapter 4. Polychronic and monochronic time are the subject of chapter 10. Again the authors discuss the impact of the dimensions of worldview on time orientation. A person’s identity is defined differently in collective and individualistic societies. Chapter 11 contrasts individualism and collectivism. Understanding the differences will prevent a lot of misunderstanding and lead to appreciation. Power distance is explored in chapter 12 and gender roles in chapter 13. The authors point out that the cross-cultural worker will experience significant differences in these areas. Awareness of how these issues are viewed in the new culture will help avoid misunderstanding and conflict. The issues of honor and justice are discussed in chapter 13. “At its core, the concept of honor is a statement of who a person is.” (p. 197) “At its core the basic focus in justice-oriented societies is what a person has done rather than who a person is.” (p. 198) The chapter focuses on how a person from a justice-oriented culture can understand and appreciate people in honor-oriented cultures. Part 4 turns to developing intercultural expertise. The focus of the final part of the book is putting into practice the foundations and patterns of intercultural communications laid out in parts 2 and 3. Chapter 15 is about cultural adaptation, learning to live in a new culture. Phases of adjustment and dealing with culture shock are the main topics. The authors give a full chapter (17) to developing intercultural relationships. Because discipleship is built on relationships the authors explain the phases of developing intercultural friendships. Chapters 18, 19, and 20 explore evangelism, discipleship, and church planting. The limitations of space makes for brief discussions on each topic. The intercultural communication dynamics are highlighted but not developed in any depth. Chapters 21, 22, and 23 discuss applying the patterns of intercultural communications in teaching settings, teaming, and conflicts that come when crossing cultures. Helpful suggestions are made but not fully developed. The final chapter is a brief discussion of the future of intercultural studies. One comment that stood out to me was, “we must beware of the temptation to turn intercultural communication principles into mechanistic techniques that we use to guarantee success in bringing more people to Christ.” (p. 353) These principles are tools in communicating the gospel, helping us to make it understood in other cultures. They help us make it clear but God causes conversion and growth. The book is clearly designed for use in the classroom. Each chapter concludes with a case study with discussion questions. Outside a classroom setting, I would encourage individuals to invite another person to read the book with them and discuss the case studies together. Each chapter also has numerous sidebars with quotes, stories, web resources and various charts. The authors do indeed fulfill their task of walking the reader through the “critical elements that comprise an introduction to intercultural communications for Christian workers” (p. 3). Where the reader would like more details, suggestions for further reading are offered. The book is an excellent text for the college or seminary classroom. It would also serve as helpful refresher for anyone whose classroom days are behind them.